Remember the days when you secured your Yellow Pages listing in the "telephone directory style" publication that was actually printed and physically distributed to millions of people around the country? You probably do, it wasn't that long ago, and was probably one of the methods you counted on for potential customers to find your business. Yellow Pages is still around but, as a company, they've evolved into the digital world and we don't see their directories dropped off at our offices and homes anymore. However, while Yellow Pages may have evolved, many of their small business customers have not. This is certainly the case for many independent office products resellers who have largely failed to establish a digital footprint, and are disappearing from view as a result. "After spending many years immersed in information technology and developing trends in the use of social media and digital marketing, I've concluded that most small business owners don't understand how all the pieces of the digital world fit together, or where to start to try and take advantage." There's no doubt, trying to make sense of the digital world is an overwhelming subject and it's understandable why small businesses are lagging behind. Advertising in the Yellow Pages was easy, all you had to do was pay your money and someone else took care of all the details for you. Same thing if you decided to place an ad in the local newspaper. Invest a little in your copy and your sales rep took care of everything else for you. Trouble was, you could never be sure just how many leads or customers could actually be attributed to whatever you invested in this "analog" marketing. But .... bottom line, it was easy and it became a habit, despite potential misgivings on the ROI! In the context of historical analog marketing methods, inbound digital marketing, email marketing, and social media audience development and engagement is not easy which explains why it's being neglected. The thing is, once digital marketing is broken down to its component parts it's really not so difficult and, in successfully building a relevant social audience, a greater ability to get closer to potential customers is established than could ever have been achieved with "old-school" analog marketing. So, just like advertising in the Yellow Pages and the local newspaper became a habit, so now must become the daily routines for building a relevant social audience. 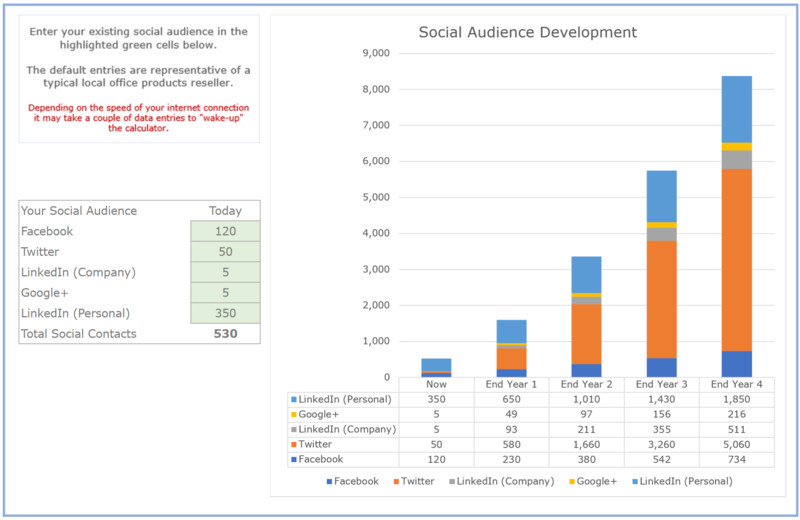 Learn what can be achieved in terms of social audience development over time. See why you can't afford to ignore investing in audience development and engagement! Because it's proven difficult for small business operators to know where to start to develop their social audiences, those who do invest and who do succeed will add enterprise value. Building an engaged social audience leads to more web traffic, which translates to more leads, which then translates to more customers. Most business owners will, at some time, contemplate a sale of their business and, when that time comes, the objective is to benefit from the the highest possible valuation. A prospective buyer will pay more for a profitable, growing business and, will also be likely to value a business growing on the back of a successful digital strategy, more highly than one that isn't. A stodgy, analog, office products reseller will be fortunate to get a 3 or 4 multiple for its business. Think of it this way, a business with $2M in annual sales, 1-2% revenue growth per year, 5% EBITDA, and owner compensation of $150K per year, may be valued between $750K and $1M. That is, if a strategic buyer can be found, who has the potential to merge it with an existing business and reduce overhead expense through synergies. However, that same business with 7% annual revenue growth, will increase its top line 31% in four years but, more importantly, while maintaining the same owner compensation and achieving the same EBITDA %, will be likely to increase its enterprise value by nearly 100% over that four-year period if (as is more likely with these performance metrics) the owner can attract a 6X valuation. In this context, spending a couple of hours a day to develop a relevant social media audience, while simultaneously engaging in the other components required for successful inbound digital marketing, should begin to look like a pretty attractive investment from an ROI perspective. You can't develop a relevant social audience overnight just like a relevant email contact database couldn't be developed overnight. However, the good news is, that it's never too late to start and that steady, consistent effort will pay dividends over time. Many "old-school" business operators have viewed social media with disdain and ignored its growing role in modern digital marketing. The roots of their disdain can usually be found in a lack of education and understanding of the potential value of building, and effectively engaging, with a relevant social audience. To survive and prosper in the digital world, this disdain must be overcome and efforts must be directed toward building audiences on relevant social platforms and then to start to successfully market a value proposition on those platforms. The digital footprint for office products resellers is very weak and there's an urgent need for these businesses to get on their paths to a digital transformation. There's an office products growth opportunity to be gained by leveraging aftermarket office supplies alongside the new behavioral norm as buyers research before ever contacting a salesperson. Digitol can help you start to build a relevant, engaged social audience. Learn how to develop a social audience and make it an indispensable part of your strategy. Digitol's turn-key solution for office products resellers helps improve the future for office supplies dealerships, providing all the tool needed to help increase market share and reduce customer churn. Click the button below to learn more about the Digitol Service!